BCG&A #1 was built in November 1906 by the Russell Car & Snow Plow Co. of Ridgway, Pennsylvania for the Boyne City, Gaylord & Alpena Railroad at a cost of $3000.00. The plow, known as a Russell size #2, weighed about 55,000 lbs. and was of all-wood construction. This plow represented a standard design produced by Russell from the 1890’s to the 1930’s. 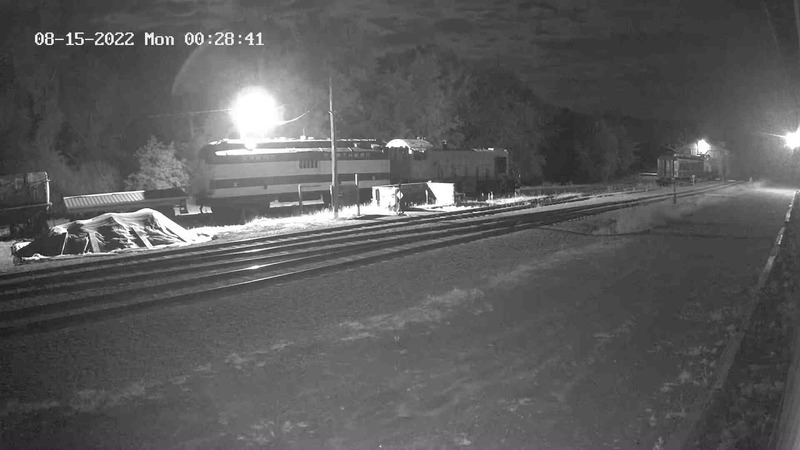 The patented design forced snow to either side while keeping the plow on the tracks. It could effectively handle drifts up to sixteen feet deep. However, to do this, it required a large amount of power. The plow was not self-propelled but designed to be pushed by one or more steam locomotives. Communications between the plow pilot and the locomotive engineer were by bell signals. BCG&A #3 was renumbered #1 in 1935 with the Boyne City Railroad’s reorganization. It was last used by the railroad in the winter of 1959 and later placed on display in the railroad’s shop building as part of a museum. Upon the Boyne City’s closing in 1975, the plow was auctioned off and then donated by the buyer to Mid Continent. The plow suffered serious damage in 1977 while being moved by rail to the museum grounds at North Freedom. Heavy repairs, consisting of replacement of the lower end of the plow back bone timbers, were completed in 1981. Wooden Russell plows originally featured a glossy clear shellac finish. 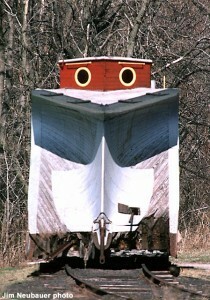 Mid Continent has restored the Boyne City plow to the painted finish applied by the railroad after the varnish weathered. The plow now appears as it did on the Boyne City, Gaylord & Alpena in the 1910 1930 period and is a reminder of the hardships of winter railroading in the upper midwest. BCG&A #3 is one of a handful of all wood Russell snow plows in existence and is thought to be one of the best preserved. It is presently on public display inside the museum’s Coach Shed. The Russell Snow Plow Co. (later the Russell Car & Snow Plow Co.) company was founded in 1889 by inventor J.H. Russell. Mr. Russell’s plow was designed specifically for the purpose of snow removal and was not a home spun contraption adapted from some old freight car as were previous railroad-built plows. Heavy white oak timbers of up to 12″ x 12″ cross section provided for the strength of the plow. A unique feature of the plow was the patented “power bar” which transmitted the power of as many as three pushing locomotives to the front of the plow. 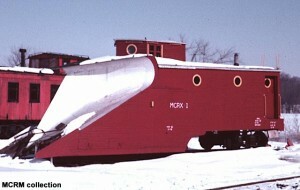 The “power bar” design reduced the chances of derailment and literally pulled the plow through the snow. Early Russell plows were built under contract by a variety of eastern car builders. Shortly after the turn of the century Russell erected a small plant at Ridgway, Pennsylvania to build all types of snow removal equipment. Later some freight cars and several caboose designs were added to Russell’s output. 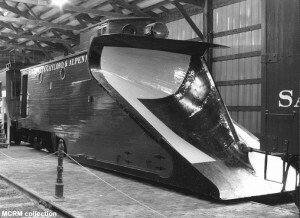 By the 1930’s an all-steel snow plow was being produced with wide acceptance by the railroads. Russell’s Ridgway plant finally closed in 1951, although many of their plows still see use on snow-bound railroads every winter.